If YES, the bird will need our help. Click here for instructions. If YES, the baby bird is probably a fledgling. Fledgling birds are supposed to be out of their nests and are learning to fly. Fledglings need several days or weeks to learn how to fly and forage for food. Their parents will continue to feed them during this period. Leave the area and do your best to keep pets and children away from the bird. The parents will not feed the fledgling while people are around. If NO, attempt to find the nest. An uninjured bird found on the ground with few or no feathers needs to be returned to the nest. Look in nearby trees and bushes to see if you can locate the nest. If YES, and the bird is warm, simply put the bird in the nest. If the baby is cold, warm it in your hands before returning it to the nest. 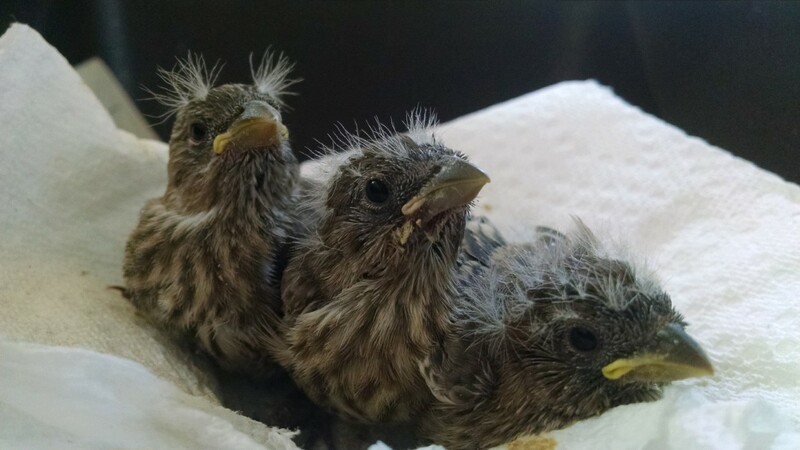 If NO, you can't locate the nest or are unable to reach it with a ladder, or if the original nest is destroyed, you might be able to make a substitute nest for the bab(ies) or they may need to be taken to a wildlife rehabilitator. Contact us for more information. Once you've returned the baby to the nest, you can watch from a safe distance, preferably indoors. Many wild birds will not return to the nest if you are visible. If a parent does not visit the baby within a few hours, call us for more information.